Music ministries have a long history at Salem Church, from the Moller four-manual pipe organ, installed in 1925, to its Schantz two-manual organ of 34 ranks, installed in 2009, to the voices of the adult, youth and children choirs as well as the sounds from handbells and a grand piano. Music is a vital part of our worship. We seek to incorporate a variety of music through choirs, hymns and solo music, from contemporary to traditional. The Salem music staff is committed to inspiring choirs to develop their musical gifts to the best of their ability to the glory of God. Music is incorporated in Vacation Bible School programming, the children’s Christmas play, Sunday School and special events throughout the year. We welcome anyone to join Salem’s music ministry as we share our love for music. Salem Choristers is an adult choir. Practice is held for one hour, beginning at 7 p.m. each Tuesday. 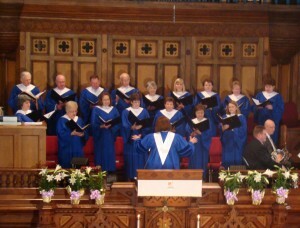 The choir sings every Sunday, taking a vacation, however, over the summer months at which time special music is arranged. 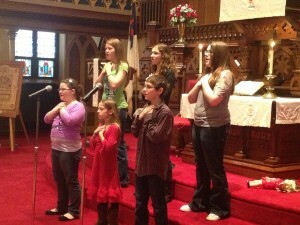 Salem Selah is a youth choir comprised of youth in grades 7-12. Practice is at 10:30 a.m., every Sunday. The choir provides music periodically during worship services throughout the year, in the community, and at other church group meetings. Children are taught basic music reading and theory through activities, games and singing. Kingdom Kidz is a children’s choir comprised of children in grades K-3. They practice on Sundays and provide music periodically during worship services throughout the year, in the community, and at other church group meetings. Children are taught basic music reading and theory through activities, games and singing. Salem’s Adult Hand Bell Choir was reactivated in 1993. The church received three octaves of Schulmerich bells many years ago as a memorial gift. A fourth and fifth octave was recently added through a memorial gift as well. This choir practices at 10:30 a.m., every Sunday and periodically performs in worship and with special performances during holidays.